Paul’s first dancing role with Anjali was in Rock and M&M in 1998. He performed in Matthew Hawkins’ Prosperous Beach at Blazing Festival at the Royal Festival Hall in London and at the Purcell Room. Paul went on to perform in Matthew Hawkins’ Angels and Exiles with dancers from the Royal Ballet at the Royal Opera House, London. His first national tour with Anjali was Through New Eyes in 2001-2. 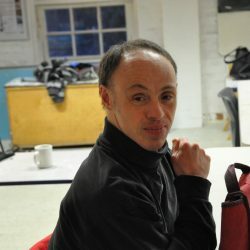 Paul previously trained in drama and was a member of the Oxford-based Wild Theatre Company. Paul trained as an Education Leader with Anjali and attended an Introduction to Teaching course in 2009-2010.